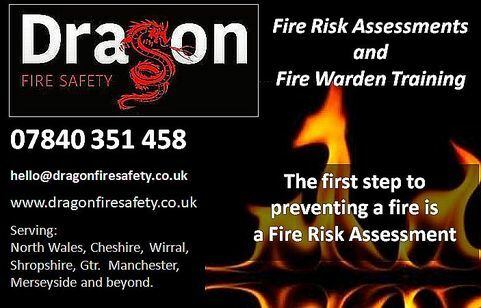 Dragon Fire Safety is customer focussed and is committed to providing you with the very best quality fire risk assessments in Shrewsbury and Shropshire. We deal with all types of premises for businesses, organisations and landlords throughout the region, to reduce the risk of fire and protect those who are in and around your building. Current fire safety law is known as the Regulatory Reform (Fire Safety) Order 2005, commonly called “The Fire Safety Order”. It states that virtually all types of premises must have a “Suitable and Sufficient” Fire Risk Assessment, and it is the responsibility of everyone and anyone with a degree of control over the premises to ensure this is carried out. Completing a fire risk assessment is the first step to making your premises safe from fire and is an organised and methodical look at your premises, the activities carried out and the likelihood that a fire could start and cause harm to those in and around the premises. This is a very big responsibility for anyone and that is why, other than for a very small, straightforward premises, the Responsible Person will need the help of a trusted and competent fire risk assessor with specialist training and knowledge, and this is where we come in. Dragon Fire Safety will visit your premises at a time convenient for you and make a thorough and comprehensive on-site inspection and gather as much information from you as possible. Soon afterwards you will be provided with a report that is specifically written for your premises. This will detail how your hazards are currently being controlled and areas where further controls are needed with suggestions of how to achieve compliance. We do not supply or service fire safety equipment, so you can be certain that if we tell you that you need something, you really DO need it to comply with the law, and not because we want to sell you something. Our prices are very competitive and reflect the time and care we take and the quality of our report. We are Fire Risk Management Specialists – it is ALL we do and we do it very well. We can take away any worries you have of deficiencies being found in a fire safety audit by the Fire & Rescue Service as our fire risk assessors have worked for many years for the Fire Authority and understand their requirements well – we speak the same language! We guarantee that you will comply fully with fire safety legislation if you follow all our recommendations. We cover all areas of Shropshire including Shrewsbury, Ludlow, Ellesmere, Oswestry, Wem, Whitchurch, Market Drayton, Bishops Castle, Clun, Church Stretton, Craven Arms, Cleobury Mortimer, Newport, Wellington. Telford, Ironbrdge, Bridgenorth, Much Wenlock, and all towns and villages throughout the Midlands. Call us to discuss your needs and book an appointment with one of our professional and friendly assessors.